The small children from Gangura received a wonderful gift at the year end. 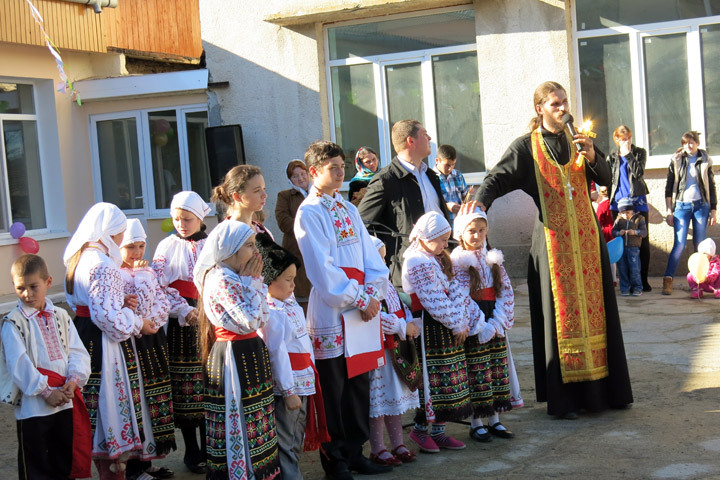 The official opening and blessing of the second block of the kindergarten took place today, so that further 40 children will visit the kindergarten. 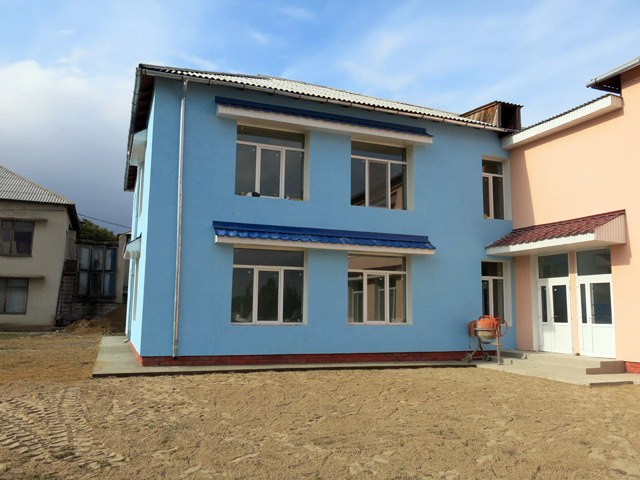 It is to be mentioned that the kindergarten did not function over 17 years and the children did not have any possibility for the pre-school education. Two blocks are repaired and furnished today; altogether 80 children may be educated in this institution. The vice-president of the district Ialoveni, Mr. A. Melenciuc, the mayor of Gangura, Mr. I. Basli, the advisors of the commune Gangura and children and parents participated at today's event. 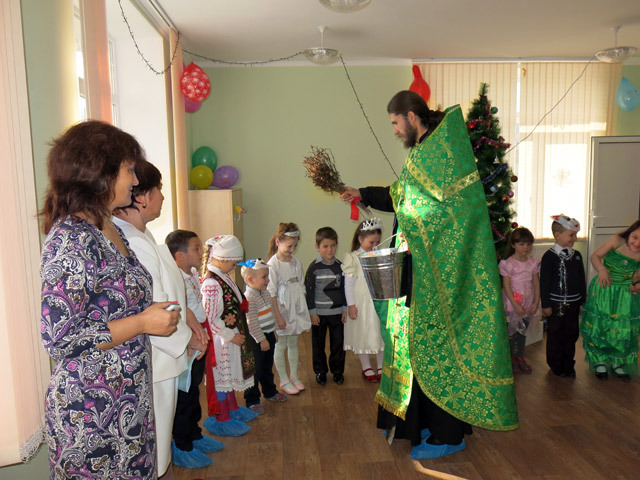 Two orthodox priests blessed the kindergarten. The small ones, who will visit the kindergarten since New Year, prepared a small concert for all present. They received Christmas presents from PRO UMANITAS and the district council Ialoveni. Our local coordinator, Mrs. Larisa Ilascu was the promoter of the project in Gangura and our hostess today. We warmly thank in name of the parents and the children to all partners, who contributed to this big project. We managed together to offer a future to the small children. PRO UMANITAS wishes to all its partners and friends blessed and quiet holidays and a Happy New Year! Merry Christmas! In the small Principality Liechtenstein the Hilfswerk Liechtenstein celebrates its 25th anniversary under the presidency of Beatrice Amann and in presence of Her Serene Highness Countess Marie von und zu Liechtenstein and Excellency Stanislav Shyrokoradiuk, Bishop of Kiev on December 6th. P. Erwin Benz appreciates the organization, which helps admirably and works effectively in about 40 countries. 242’060 kg of humanitarian goods were send and 18’905 kg of humanitarian goods were directly delivered in 2013. PRO UMANITAS can also receive regularly humanitarian transports. 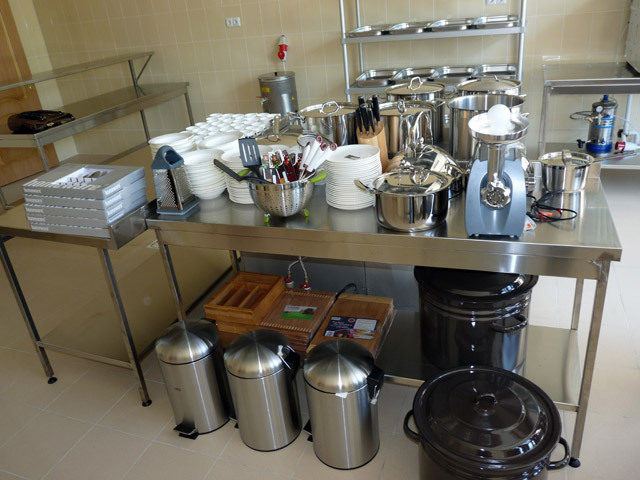 In addition to that, Hilfswerk Liechtenstein finances the current costs of two day care centers for children from deprived families and co-finances the costs for the soup kitchen from Grigorauca. 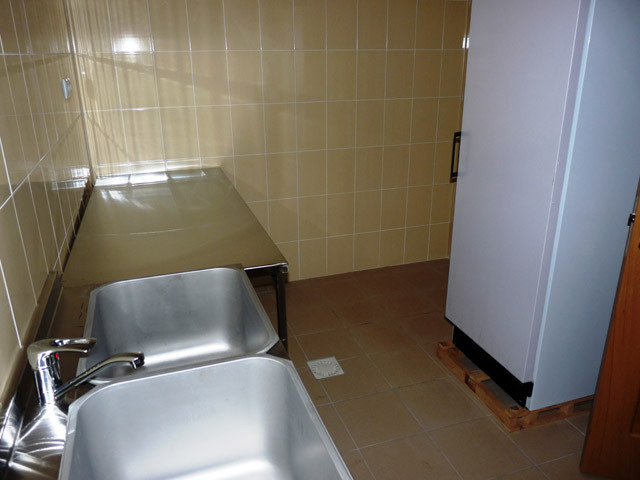 The mayor’s office placed new rooms at the disposal of the day care center for elderly “Sf. Petru”. These rooms were repaired and furnished. Today, on December 6th we could officially open the center. Of course the rooms were blessed by the local priests. The Holy Mass was held by four priests of different confessions. 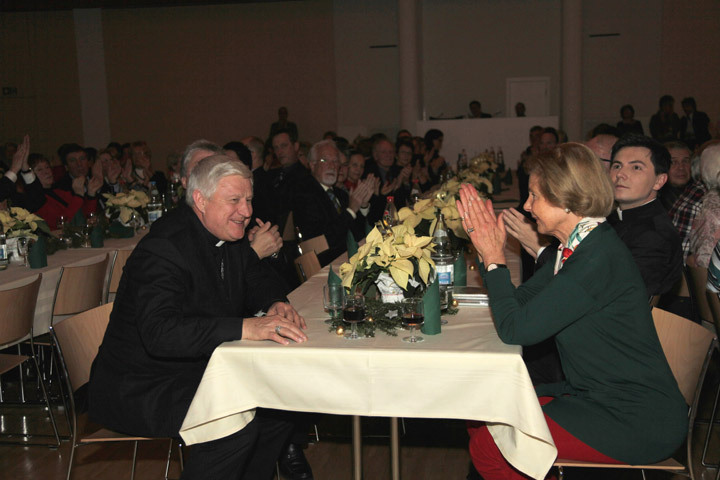 The president of the district Singerei, Mr. G. Meaun, took part at the event too. 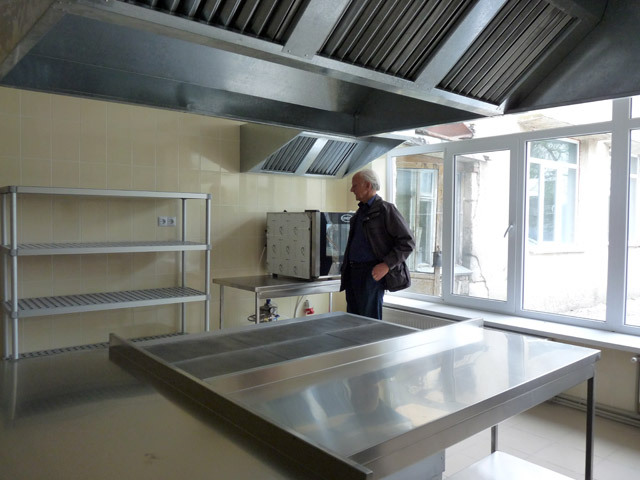 He was very impressed by the conditions, which are offered to the old, poor, lonely people. 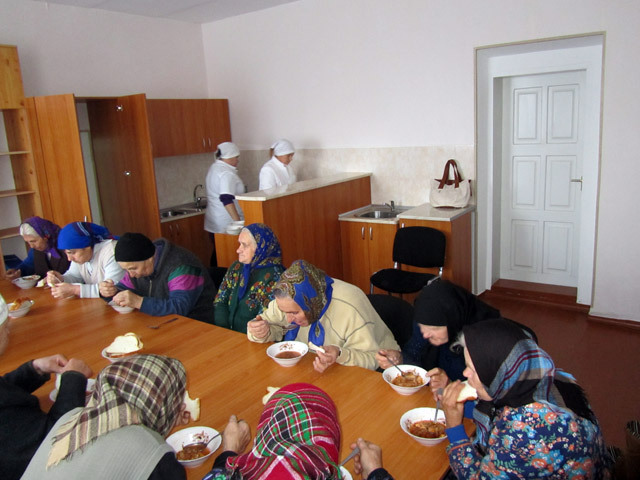 The old people, who come to the center, received food parcels from the German organization „Pro Moldavia e.V.“. Nicholas Day is a special day for children. Hoping that the Saint Nicholas will bring them sweets and small gifts, they try to be nice and good. 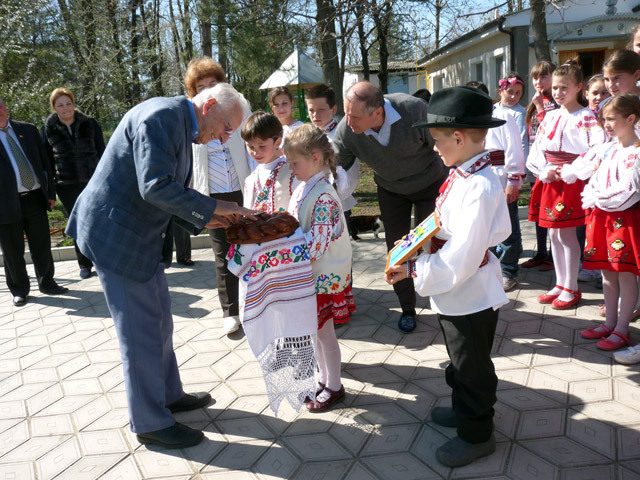 The children from Grigorauca experienced great joy to Nicholas Day. 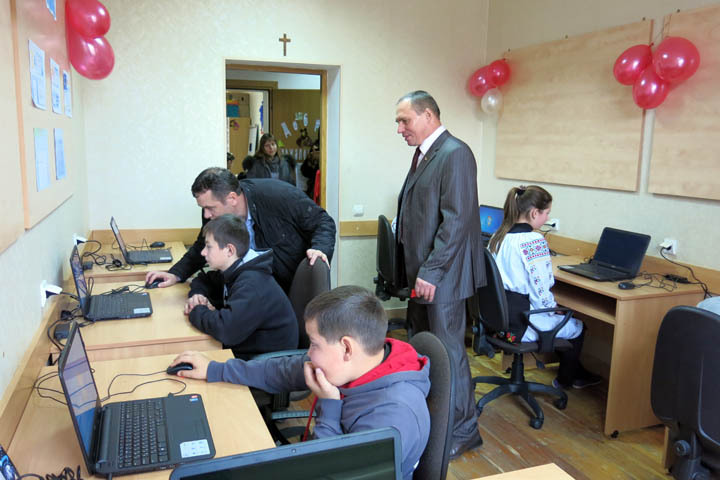 The day care center for children „Saint Maria“ received 7 new laptops for the second computer group. More children and teens can attend the computer course in the center now. 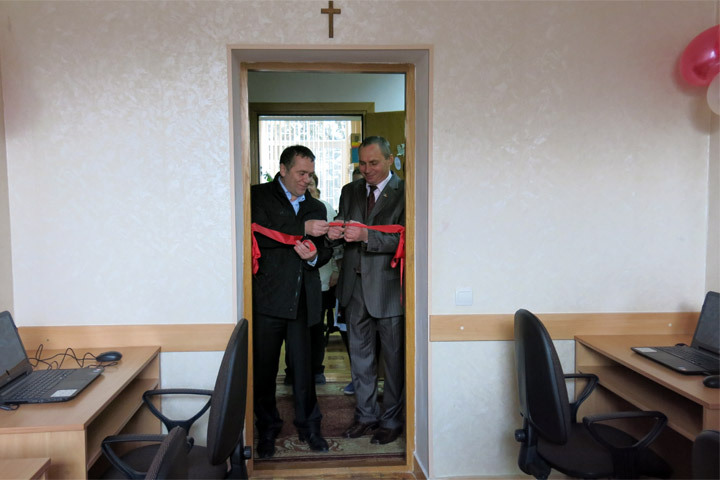 The president of the district Singerei, Mr. G. Meaun, was present at the opening of the new computer group and thanked cordially to the sponsor of the project. 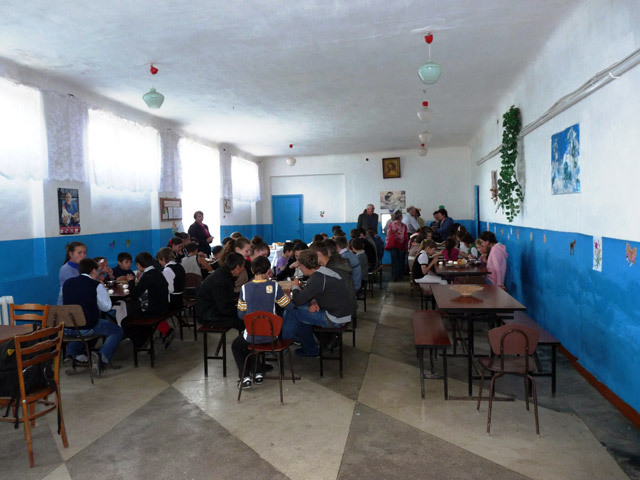 The village library also received new books – text books, different English books, dictionaries, German, Romanian, Russian classical authors, different encyclopedias, fairy tale, etc. The children from the day care center will benefit of the new books too. 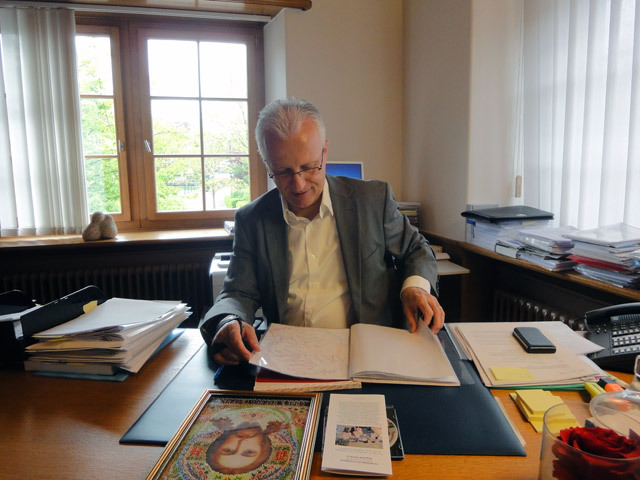 In name of the children we express our profound gratitude to the German organization „Menschen helfen e.V.“, president Dr. Robert Roithmeier, which played the role of the Saint Nicholas for the children. The village Gangura received a special guest from Austria today – Ms. Mag. Barbara Wolf from Caritas Vienna. Ms. Mag. Wolf was for the first time in Gangura, in order to visit the kindergarten. 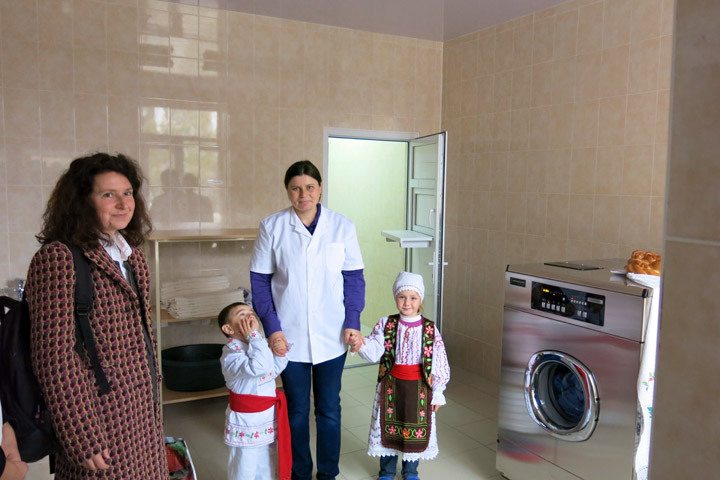 Caritas Vienna financed the repair and equipment of the laundry from the kindergarten. Ms. Mag. 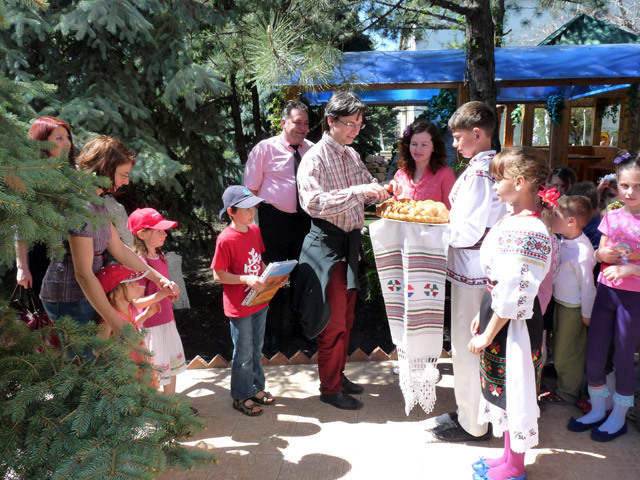 Wolf was received by the little ones according to the Moldovan tradition with bread and salt. She could have a look around the kindergarten and observe the children while doing their daily activities. Ms. Mag. Wolf visited also the office of PRO UMANITAS (PU) and had a discussion with the president of PU. 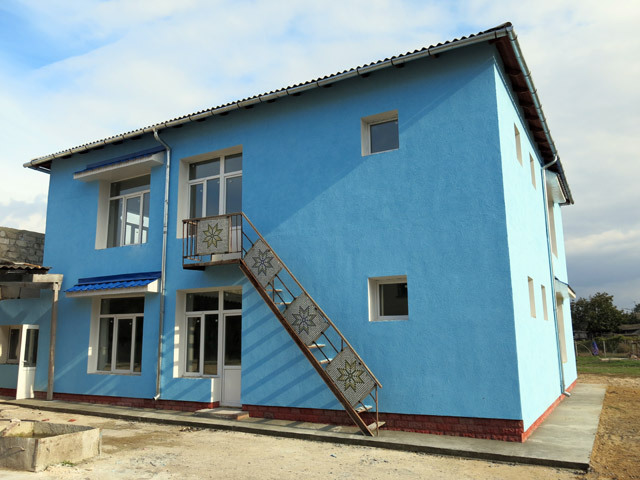 Right on time for the Advent season and only a few days after the official opening of the kindergarten in Gangura, its doors have been opened today for the first 40 children from the commune, after 17 years of vacuum. In the bright and modern furnished rooms the children will receive a pre-school education and will be supervised and fed. Today is also the day of thanking to the responsible construction engineer Mr. Anatol Chiriac, who created together with his workers the conditions for the success of the project despites many setbacks and difficult structural and technical problems. And it is the day of joy and of sigh of relief for all, who made possible this project through their donations, voluntary assignments and administrative support. 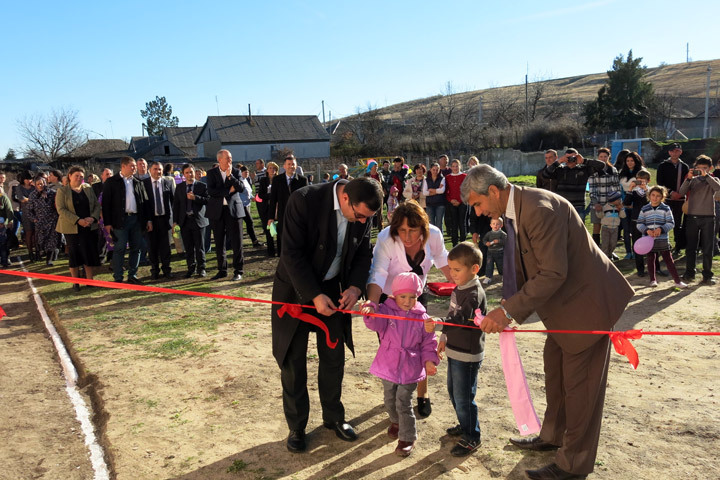 For „PRO UMANITAS“, the reopening of the kindergarten in Gangura raises hopes that the way into a good future for the little ones from this Moldovan commune was paved. 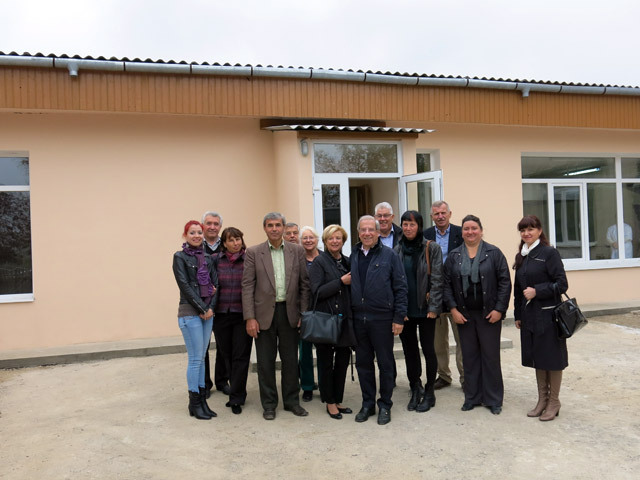 Inspired by the motto of one of our German partners „human beings need fellow human beings“ a place for rest, reflection and togetherness were placed today at the disposal of the first group of older single people from the village Grigorauca in new equipped and modern furnished rooms. After the unexpected sudden termination of the previous rooms, the old people found temporary asylum in the generous act of the local project coordinator, being placed in her private house. 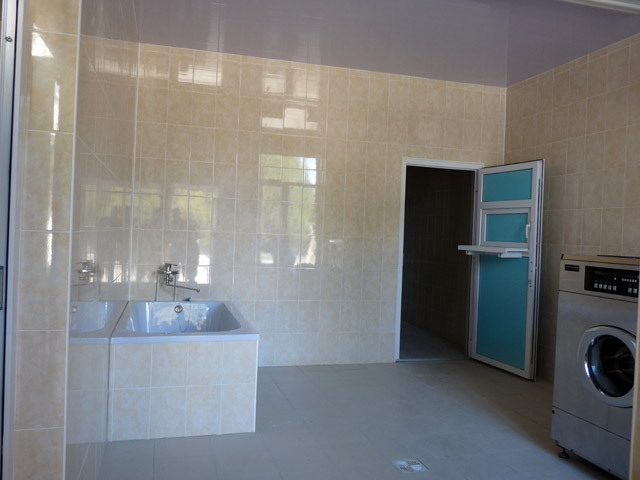 Due to a generous goodwill of the local mayor’s office and the construction firm SRL „Nicanliudcon“, „PRO UMANITAS” could give them in shortest time courage, joy of life and a feeling of human warmth by accepting them in the new rooms. The older fellow citizens receive there regularly a lunch and an appropriate care. 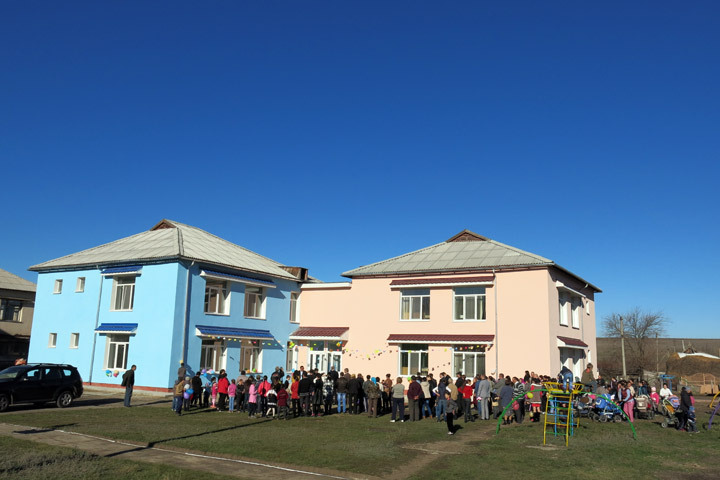 A first visit after the official opening of the kindergarten in Gangura came from Germany. 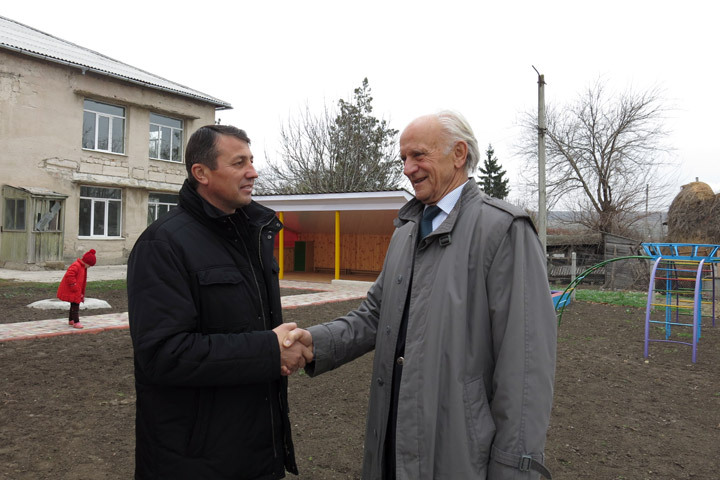 Mr. Manfred Ahlbrecht, the former 1st Secretary of the German Embassy in Moldova visited the kindergarten. He could also talk to the Vice-president of the district Ialoveni, Mr. Melenciuc. 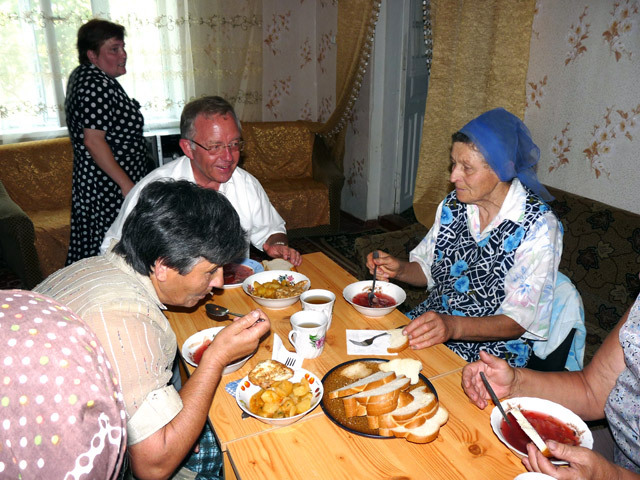 Mr. Ahlbrecht was in Grigorauca to the day center for elderly, where he greeted the old people. 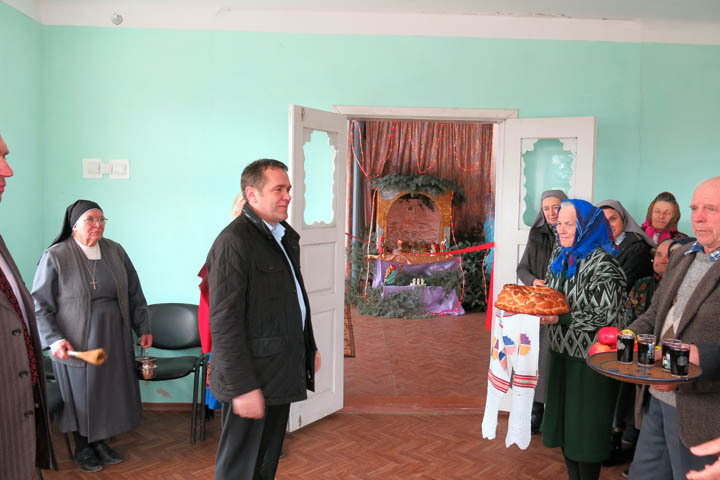 At the same time he could talk to the administrator of the Pentecostal church, Mr. Serghei Pavlovschi and visit the bakery in the village Sarata Galbenei. 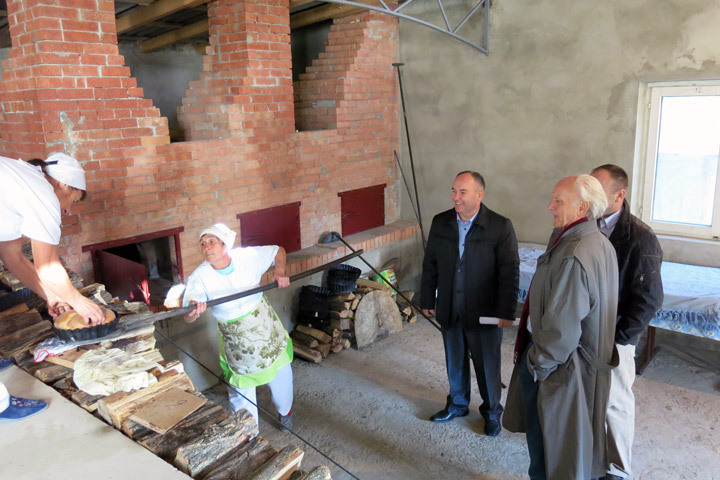 Due to Mr. Ahlbrecht a modern bakery will function in this village. Within his visit, he also visited many other projects of PRO UMANITAS. 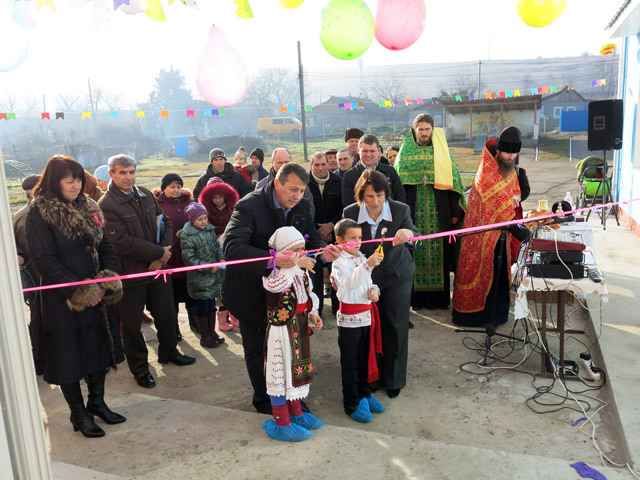 The village Gangura could exult – the kindergarten that did not function over 17 years, has been officially opened and blessed today. It was a real celebration with happy children and parents, who may offer a preschool education to their children now. The little ones received also many gifts. 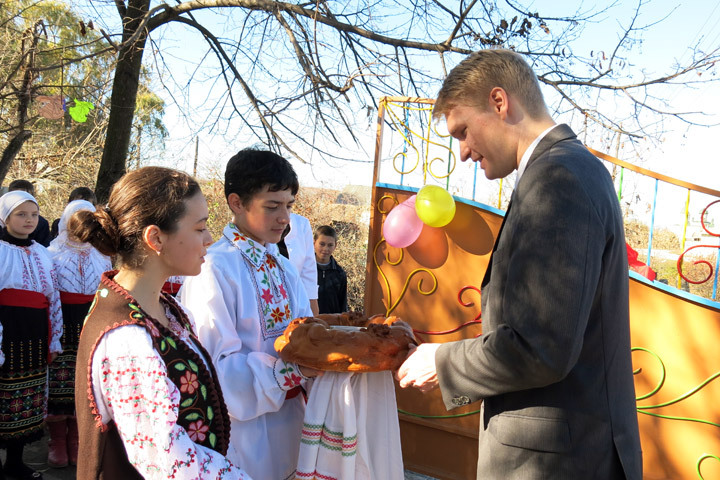 It could not be a feast day without guests of honor: the Permanent Representative of the German Embassy in Moldova, Dr. Thomas Weithöner, the representatives of „Südzucker Moldova“ SA, the deputies of Moldovan Parliament, the representatives of the district and local authorities. Of course, the local population and many children were present too. Words of appreciation were expressed, gifts were brought. 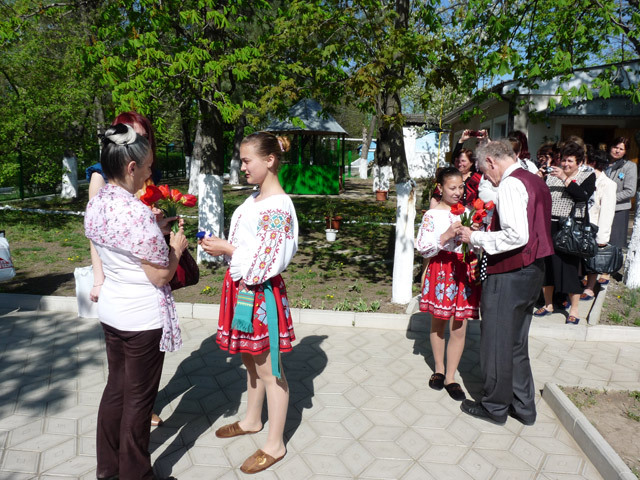 The small ones also prepared a cultural program. 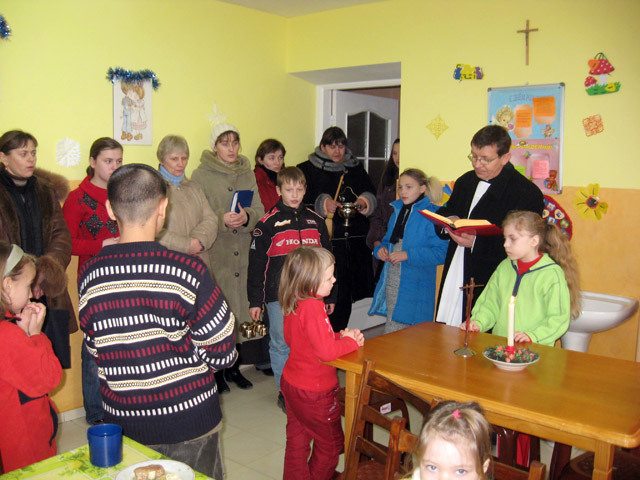 The local orthodox priest shared God’s blessings to all present. 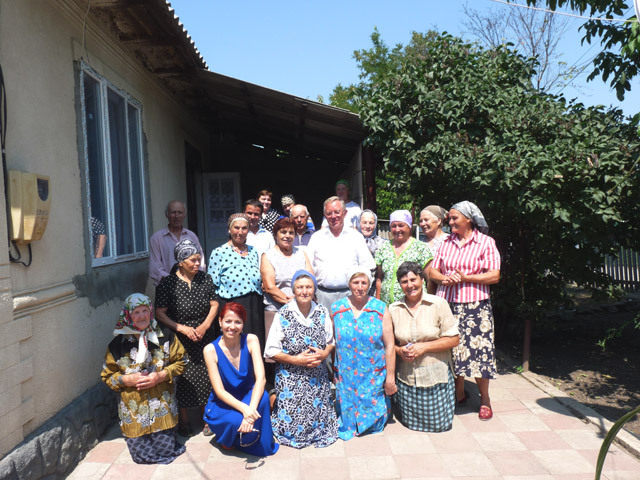 Mr. Peter Garst, the president of the Swiss organization „Help for Children in Need“ (HCN) came to his 23rd trip to Moldova. 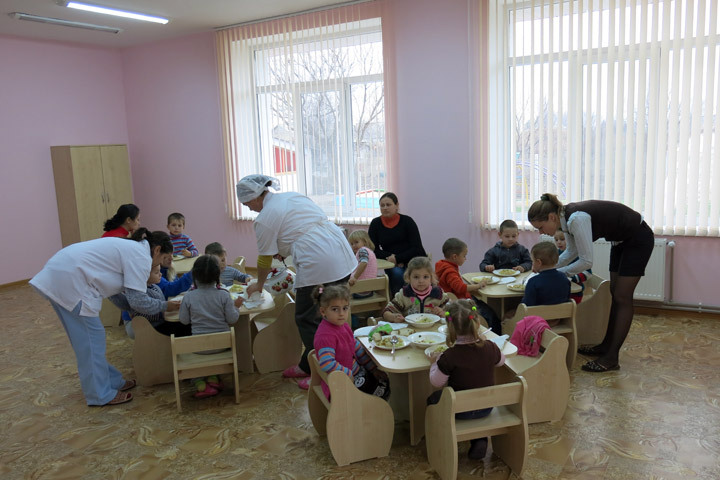 Mr. Garst visited almost all day care centers for children BUNVOLENTIA. 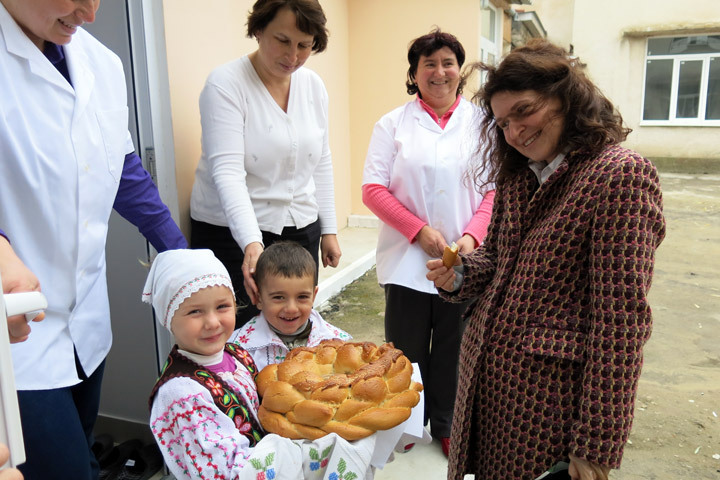 A special event was the official opening and blessing of the day care center BUNVOLENTIA Bilicenii Vechi II. He convinced himself once again of the necessity for such children projects. He joyfully welcomed the children and took the gifts made by them to Switzerland. 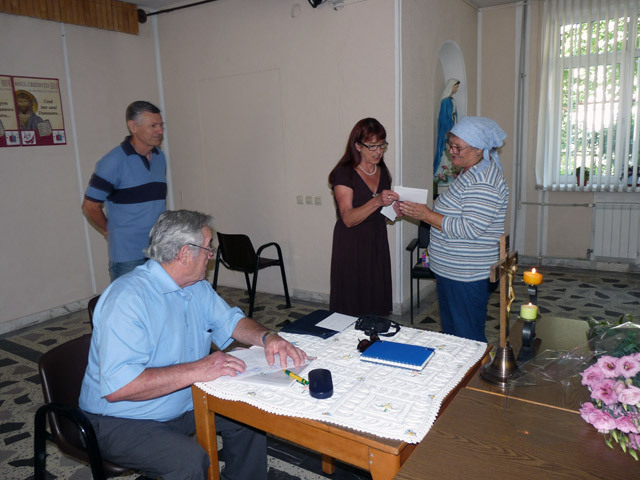 Mr. Garst could also visit the financially supported families from the villages Ochiul Alb and Grigorauca. He could make himself an impression over their current living conditions. 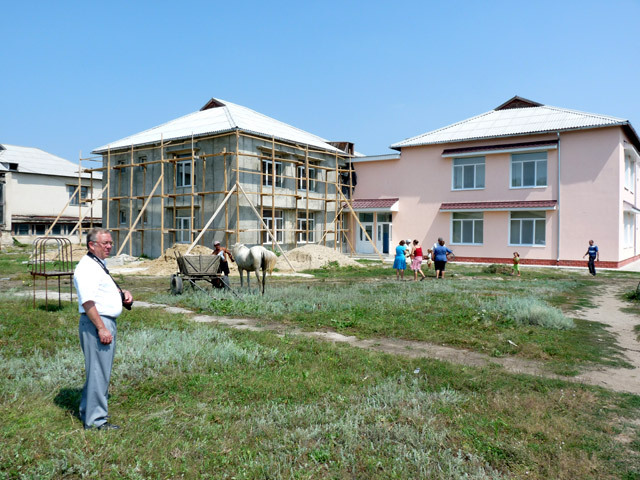 At the same time he visited the new buildings of the kindergarten in the village Gangura and examined the possibility of the implementing of other projects. The traditional student meeting took place on October 19, 2013. The student meetings are organized once in a year at each school beginning. Within these meetings the terms of the scholarship program are explained, the contracts are signed. They also give the students the opportunity to make acquaintance with each other and to communicate. The scholarship program is financed by the organization „Solon Foundation“; it supports the studies of deprived students at a university. There are 50 students this year too. The scholarship program is very importantly for the future of young people, who do not have a financial possibility, to receive an education at a higher institution. Our students are profoundly grateful for the given assistance. 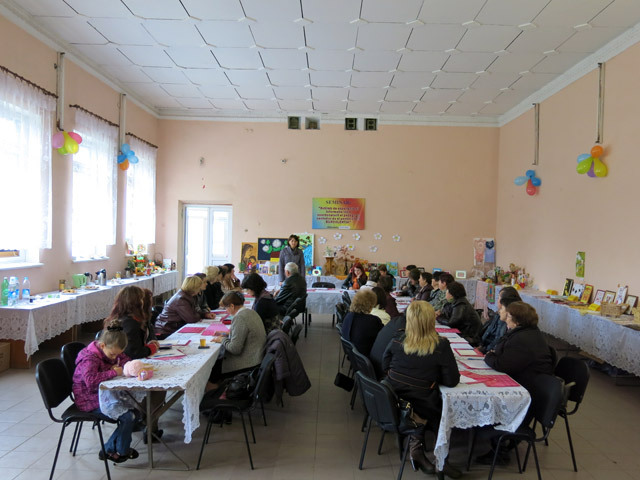 The seminars for the coordinators and educators of the day care centers for children BUNVOLENTIA take place twice per year. 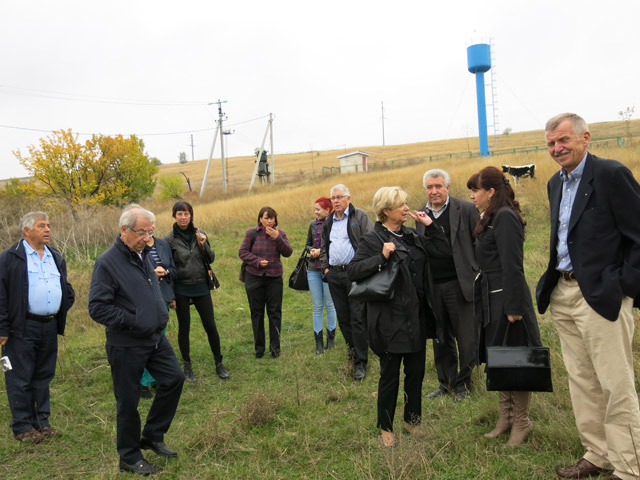 The 12th seminar was organized in Grigorauca village on October 12, 2013. A representative of the education department of the district Singerei was invited as a guest. She thanked to the educators of the day care centers for their great work and was very impressed by the children’s handworks. An exhibition of children handworks and different competitions for children were also organized. The exhibition of children handworks showed how much work is done with them and the beautiful results that our boys and girls achieve. 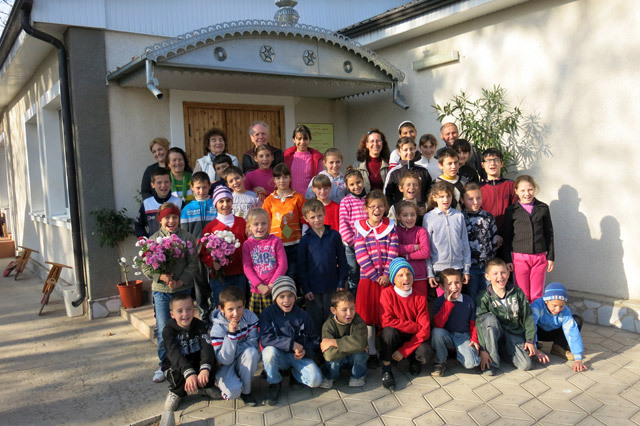 Mrs. and Mr. Helen and Gerry Zühlke, representatives of Rotary Club Zug-Kolin, Switzerland, were in the commune Gangura on October 10, 2013, in order to visit their day care center for children BUNVOLENTIA Misovca, as well as other three day care centers in Gangura. 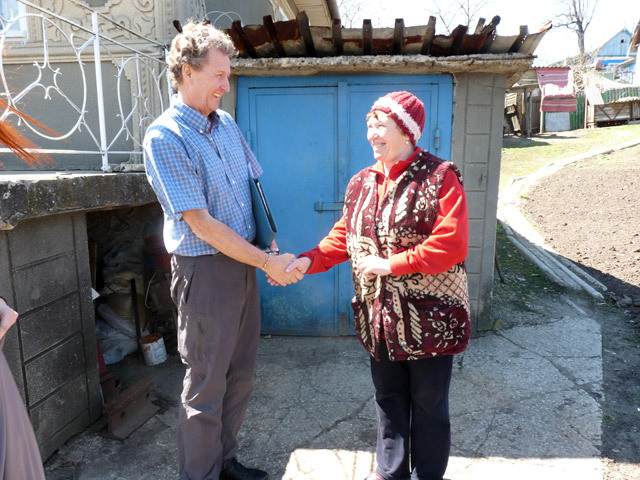 Mrs. and Mr. Zühlke visited also two families in the village Misovca, in order to make an impression about living conditions of the children that attend the day care center. They could discuss important questions with Mrs. Larisa Ilascu, our local coordinator, deputy mayor of the commune Gangura and social worker. A second visit in the village Gangura took place next day. 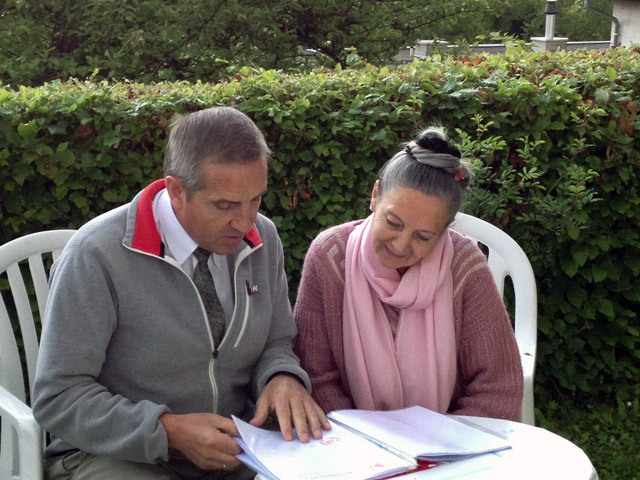 This time the Zühlke family was accompanied by other members of Rotary Club Zug-Kolin. 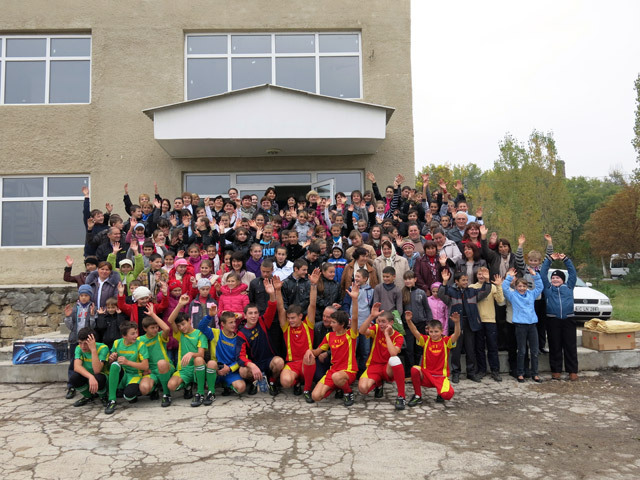 Besides the day care centers for children, the water project, the kindergarten and a poor family from the village were visited. Our guests were impresses not only by the progress, but also by the poor living conditions of villagers. The commitment of PRO UMANITAS (PU) to improve the living conditions of the social disadvantaged, poor layers of our society – children and old people began on October 8, 2003. It received the national acknowledgment in the past 10 years of its activity; the government commission delivered the appropriate certification. After 10 years of activity PU may look back on its successes: over 100 larger projects, among them 24 long-term projects. PU also accomplished hundreds of small emergency assistance projects for the benefit of the poor people. We thank God that He accompanied us on this long way and rendered us His blessing, and all partners and friends for a good cooperation and commitment for the deprived people of Moldova. The children, who will attend the kindergarten from Gangura village, will also have the possibility to play in the open air. A pavilion was repaired for them. 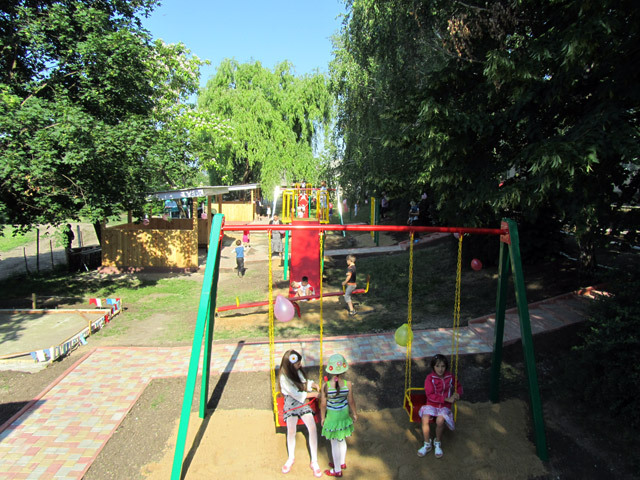 This permits the children to spend their time outdoors in hot summer days or in rain and snow. We cordially thank to Mr. Otto Gascher / Germany for that. 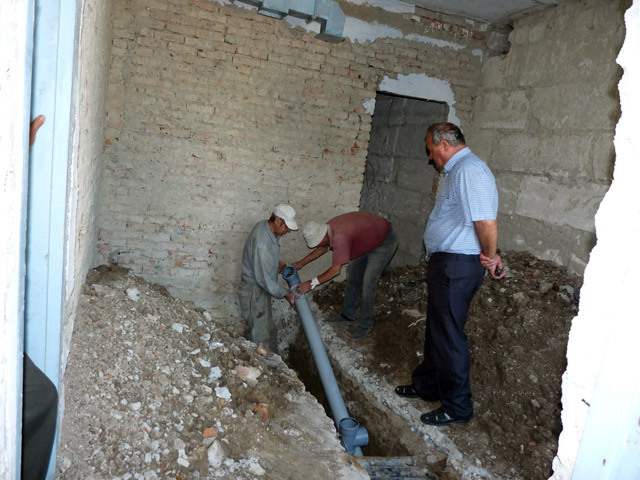 A new reason for joy – the first repair works of the second block in the kindergarten from Gangura village began. 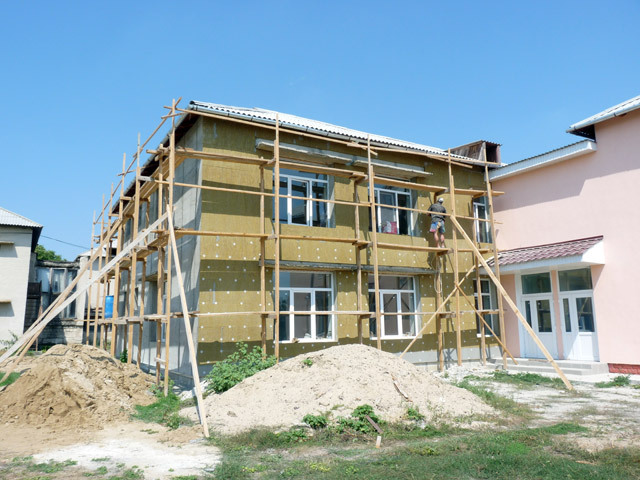 The following construction works were already accomplished: external insulation and exterior plaster, window canopies, paving and foundation for rain protection. This was possible thanks to Priest Hans Bock / Germany. 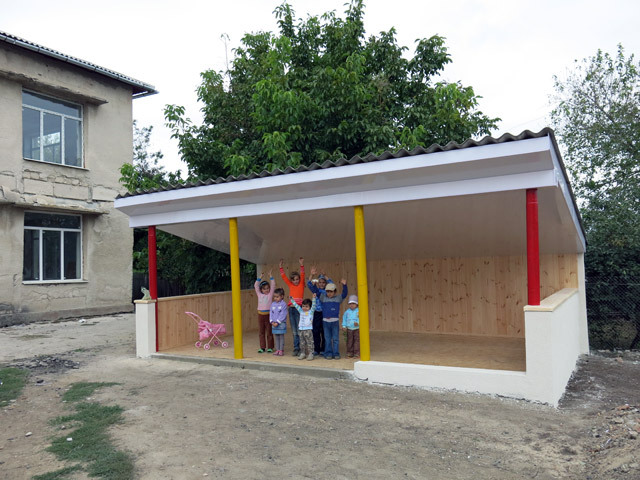 With the repair of the second block, further two children groups will be opened. Thus, the access of almost all small children to the education system in the commune is ensured. 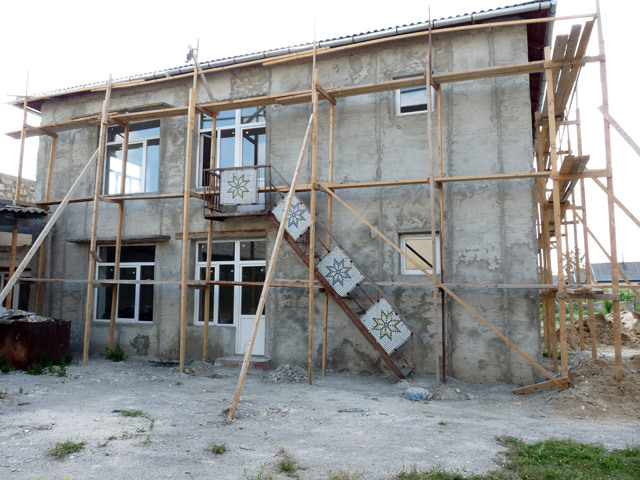 Renovation of the kindergarten from Gangura village is a big project, to which different sponsors contribute. A great work was already accomplished. For the good functioning of the first two children groups was important to repair the laundry, the shower and the toilet. Children sleep in the kindergarten at noon, therefore the bedlinen must be washed regularly. 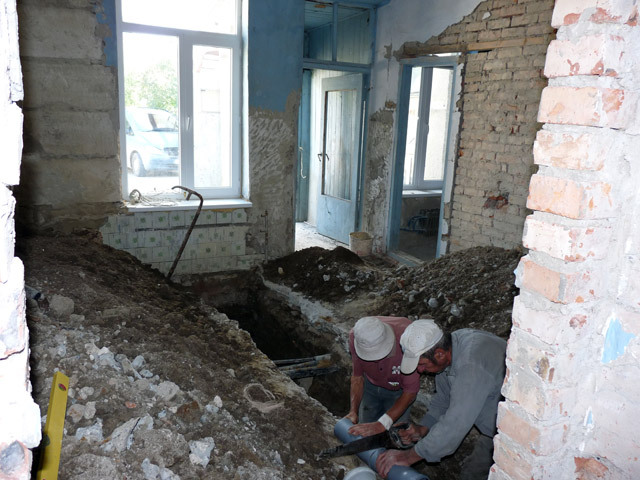 Caritas Vienna / Austria made possible the repair for the laundry. Thus, the working of the kindergarten is ensured. 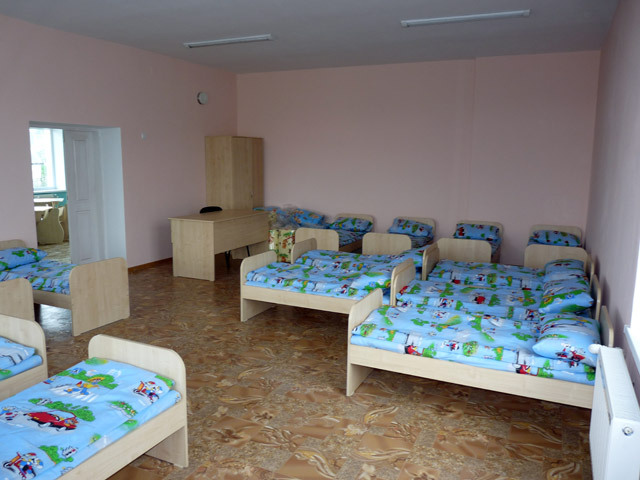 - Kindergarten in Gangura – furniture and bed linen. The new school beginning is around the corner. It is a big problem for many parents, because they must purchase school articles, but they have no money for it. The action of purchasing school articles for the children from our day care centers BUNVOLENTIA and “Saint Maria” continues this year too. It is a great help for the parents, who cannot afford buying the necessary school articles. Exercise books, pens, pencils, colored pencils, albums, a.o. were purchased for 472 children from deprived families. The parents are grateful for the rendered assistance. This action was financed by “Help for Children in Need “, Switzerland and “Menschen helfen e.V.“, Germany. 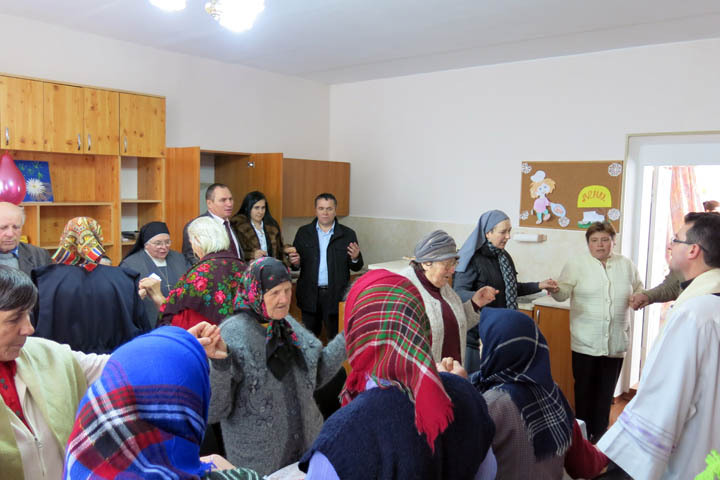 Priest Clemens Bombeck, the executive director of the German organization “Pro Moldavia e.V.” visited the projects of PRO UMANITAS in Moldova. 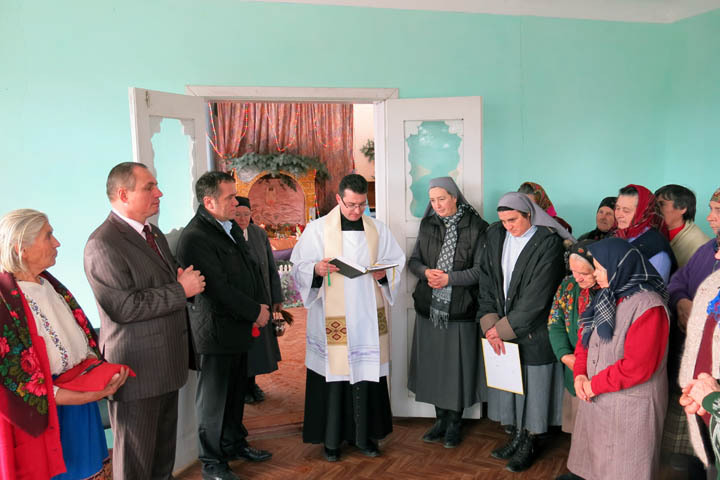 Priest Clemens was in the village Gangura yesterday, in order to see the activity of the day care centers for children BUNVOLENTIA Alexandrovca, Gangura I and Gangura II. 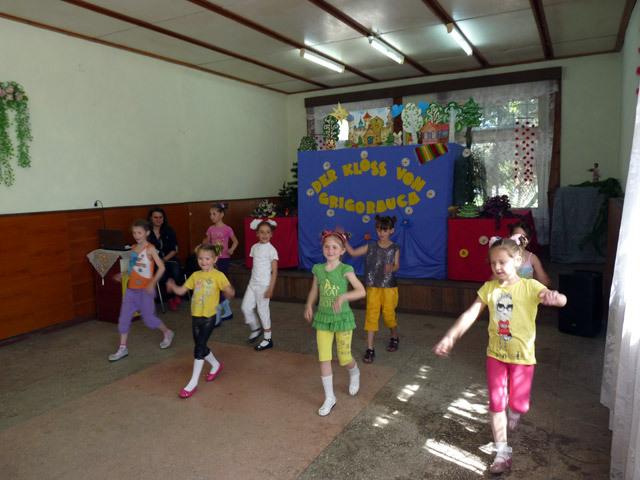 We hope that “Pro Moldavia e.V.” will take over the co-financing of one of the day care centers for children. 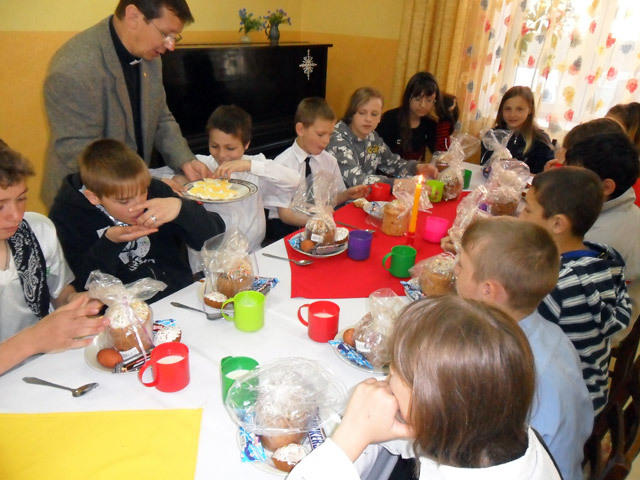 Priest Clemens visited also the kindergarten in Gangura, which is still in repair. He could visit the day care center for children “Saint Maria“ and the day care center for elderly “Sf. Petru“ in Grigorauca today. 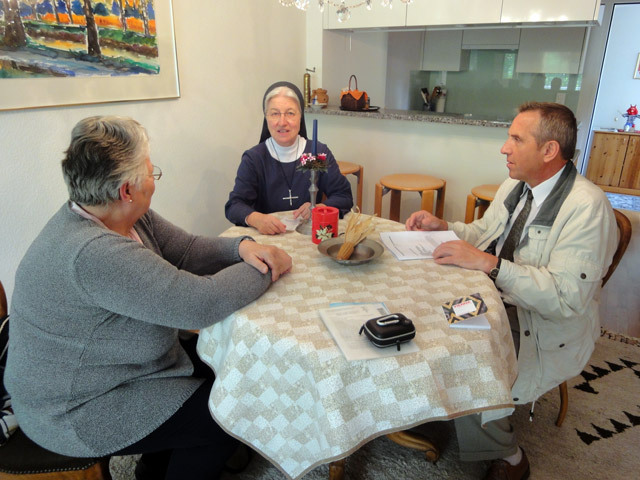 Priest Clemens met the old people from the day care center for elderly. They spoke with each other, exchanged ideas, ate and prayed together. It was a cordial, fraternal meeting. 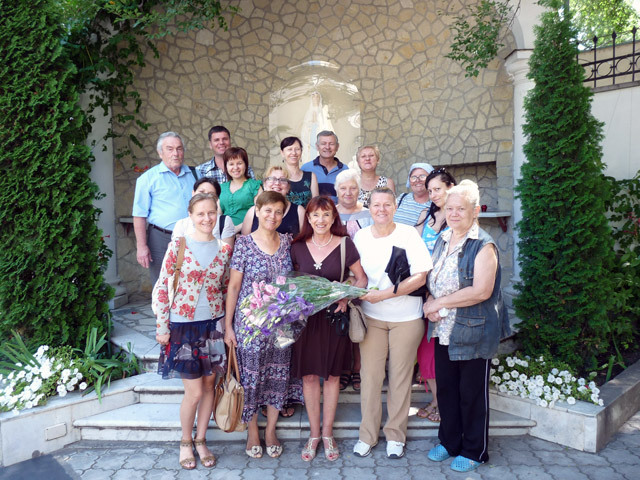 The President of the German organization „Hilfe für Osteuropa e.V.“, Mrs. Ursula Honeck comes together with Mr. Gunther Köllner to Moldova twice per year, in order to meet the financed families and to visit the clinics in Chisinau and Edinet. The children clinic „Emilian Cotaga “, burns department, from Chisinau received valuable surgical materials this time too. 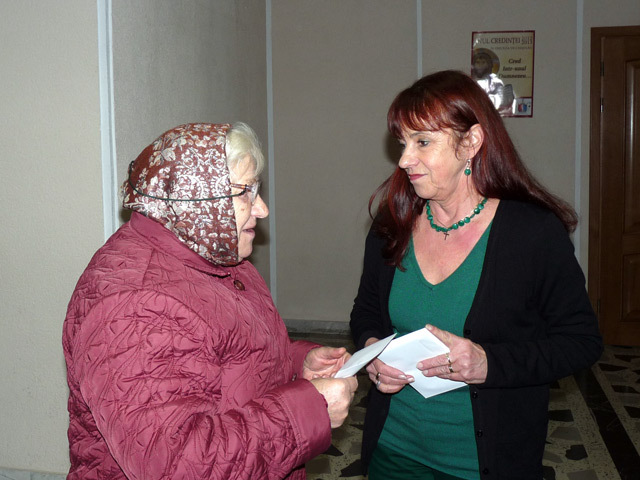 In the Republican Clinic from Chisinau and in the clinic from Edinet Mrs. Honeck and Mr. Köllner asked for the clinics’ needs; the necessary things can be delivered with the next humanitarian transport. 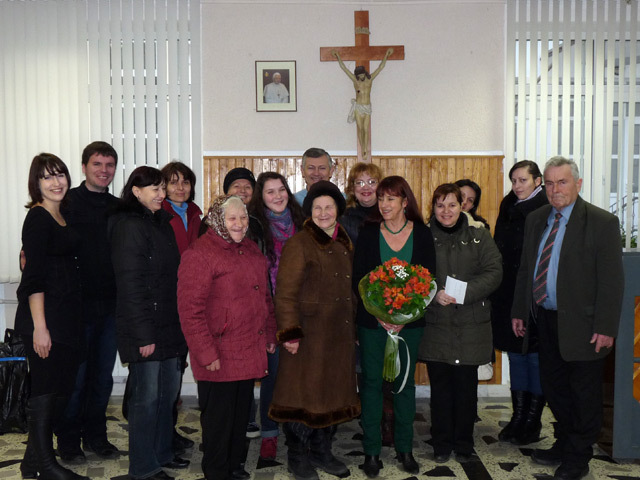 Our visitors met also the financed families. As always, it was a beautiful meeting. Mrs. Honeck could hand over the money to the deprived families. These families thanked cordially for the great support. Children let finally the school behind them and enjoy the summer holidays. 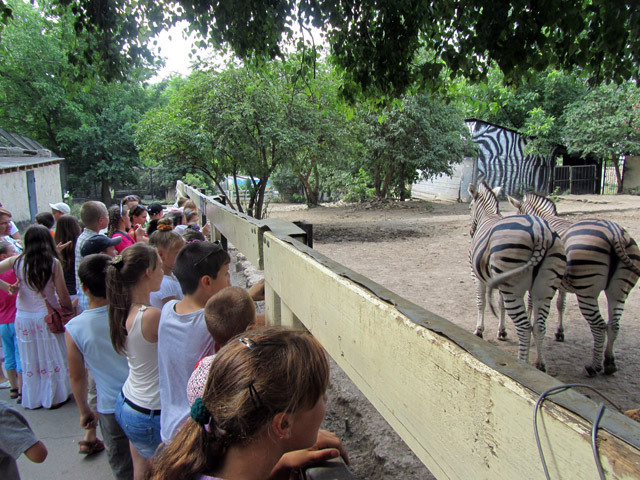 The children and the teens, who attend our day care centers BUNVOLENTIA and the day care center „Saint Maria“, had the possibility to make different trips within the summer camp this year too. Children’s hearts jumped for joy, when they saw the zoo or the botanical garden. Visits of Moldovan monasteries and historical places of the country, rest in the forest are also planned in the program. 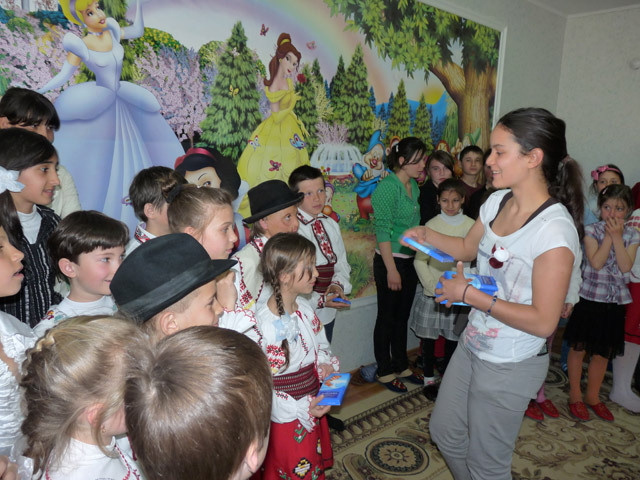 The children and teens from the day care center „Saint Maria“ went to the theatre in Chisinau. This was an important event for these children, because they watched a theatre performance for the first time. 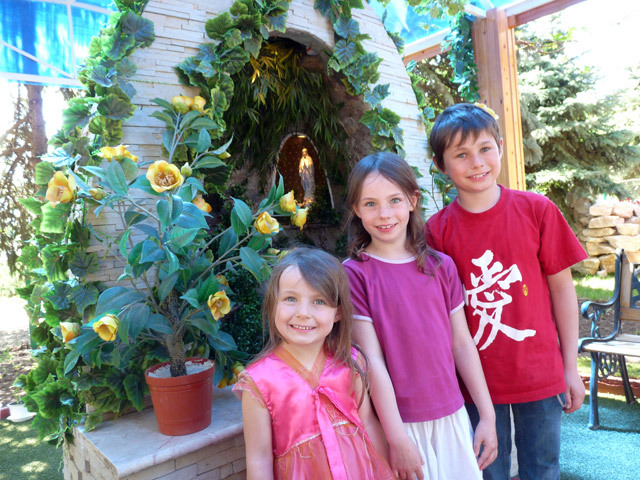 The summer camps are very important for the intellectual and cultural development of children. Parents do not afford to organize such trips for their children. Many of them have never left their villages, in order to see the sights of their homeland. The summer camps allow them to discover a part of the country’s history and culture and afford them great pleasure. 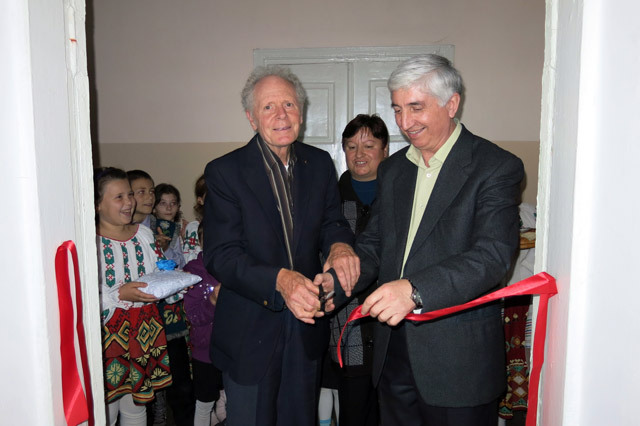 Mr. Fritz Wallner / Schierling, Germany financed the equipment of a playground in the kindergarten from Grigorauca village two year ago. The first play and gymnastic equipment were installed at that time. 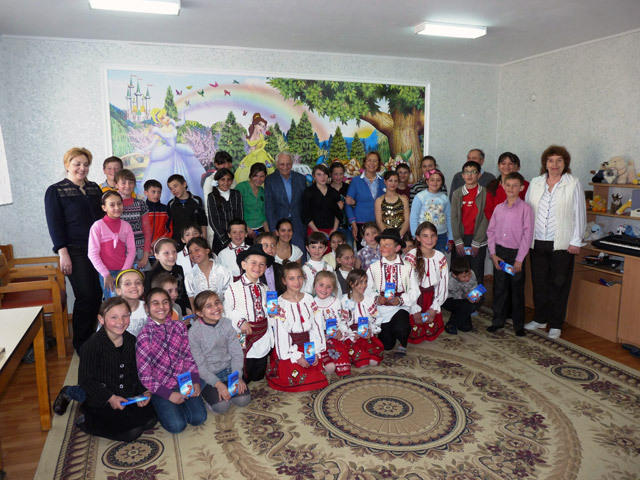 The former mayor of Schierling, Mr. Otto Gascher, donated his birthday present to the children from Grigorauca. Furniture for the pavilions was produced and installed with the received money. Our little ones are glad of the new furniture. On invitation of Priest Erwin Benz the President of PRO UMANITAS was guest in Baar and in Biel between May 23and 26, 2013. In Baar he was received by the Mayor Andreas Hotz and the Secretary of the community Walter Lipp. 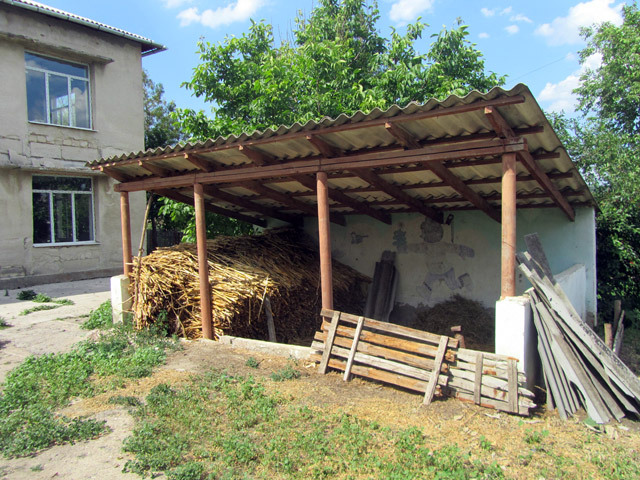 The community Baar engages itself in the context of foreign assistance for the projects of PRO UMANITAS for years; these are basically projects in Grigorauca. The two representatives of the community assured to visit PRO UMANITS. Hansruedi Langenegger from foundation Don Bosco invited to lunch in the presence of Beatrice Amann from Hilfswerk Liechtenstein in the restaurant Höllgrotten. This day ended with the May Devotions in TUGENIA with P. Erwin Benz and Tobias Moser; both are familiarized with our projects. 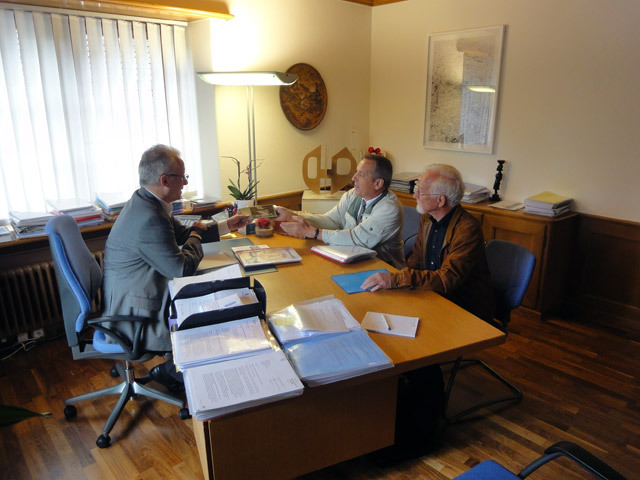 In Biel the meeting with the members of the board of „Help for Children in Need“ (HCN) took place. Within this meeting the problems in Moldova and the current projects of HCN were discussed. 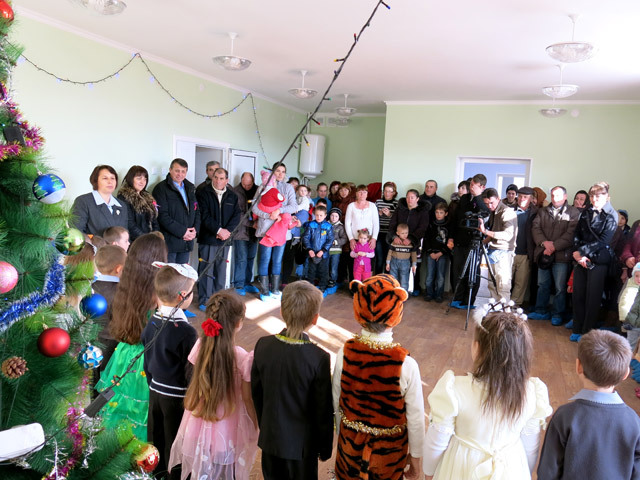 It was also decided to open a further day care center for children from poor families (it will be the 15th center). 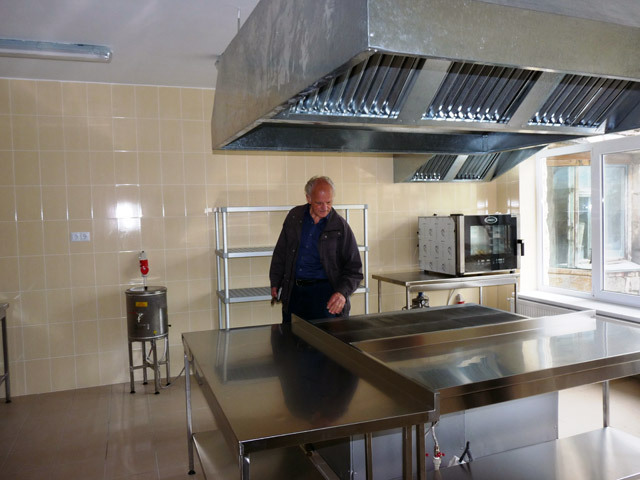 Dr. Thomas Kirchberg / Germany and the organization „Südzucker Moldova“ SA / Moldova financed the kitchen equipment for the kindergarten in Gangura. 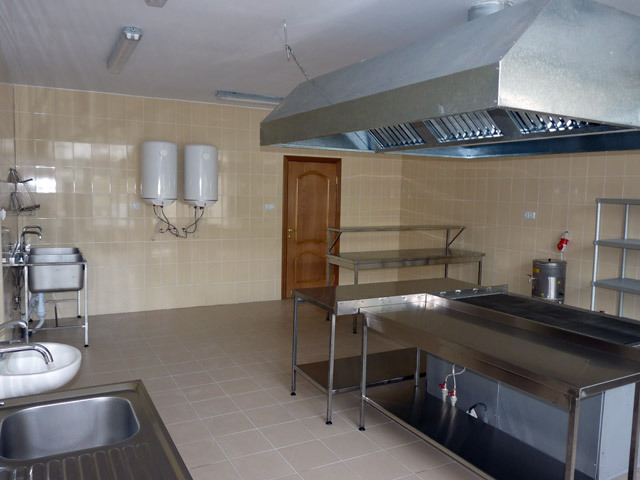 The equipment of the kitchen is necessary for good functioning of the kindergarten. 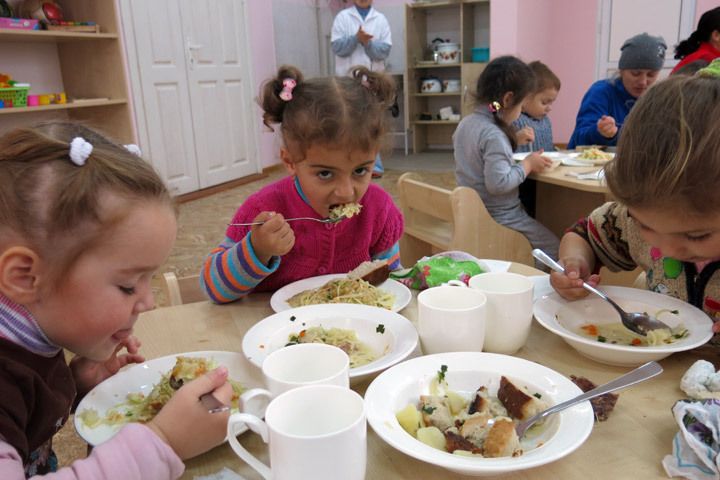 The first 40 children may go to the kindergarten and enjoy the tasty meals within a short time. The President of the German organization „Menschen helfen e.V. 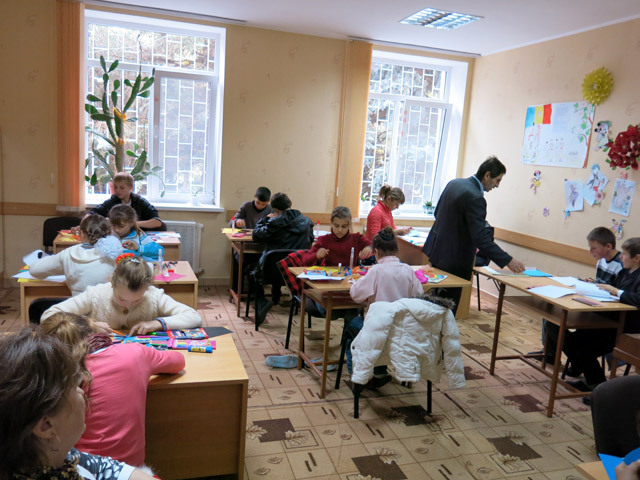 “, Dr. Robert Roithmeier, the board member, Mr. Ingo Ingerl, came to Moldova, in order to visit their day care center for children „Saint Maria“ in Grigorauca. Dr. Roithmeier was accompanied by his family. Our partners met the Vice-president of the district Singerei, Mr. Vitalii Tabarcea, and the Chief of the regional department for education, Mrs. Elena Covalciuc. The children from the day care center „Saint Maria“ had a beautiful surprise for our guests – a puppet theatre with a concert. 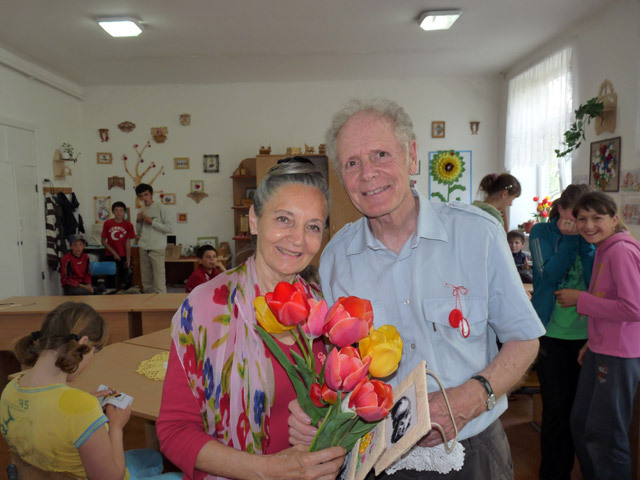 Mrs. and Mr. Martha and Peter Garst from the Swiss organization „Help for Children in Need“ (HCN) come to Moldova to visit their projects; they take part in the 11th seminar for coordinators and educators of the day care centers for children. 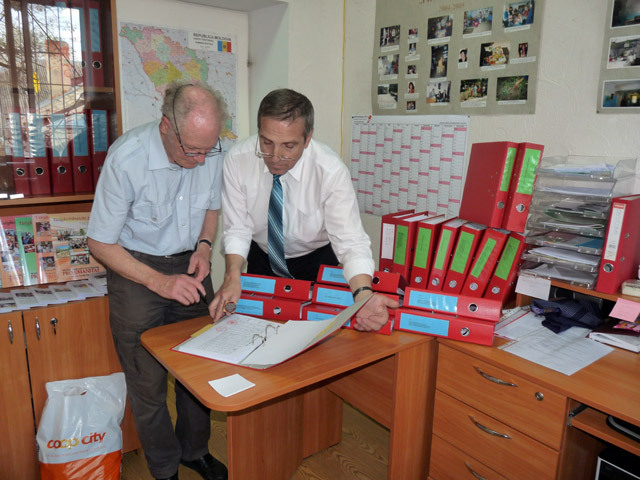 It is the 22nd trip to Moldova for Mr. Garst. Our partners visit their day care centers in the commune Gangura, as well as the kindergarten and the water tower with the artesian well in the village Gangura. They also meet the Permanent Representative of the German Embassy in Moldova, Mr. Carsten Wilms for discussion in the embassy. 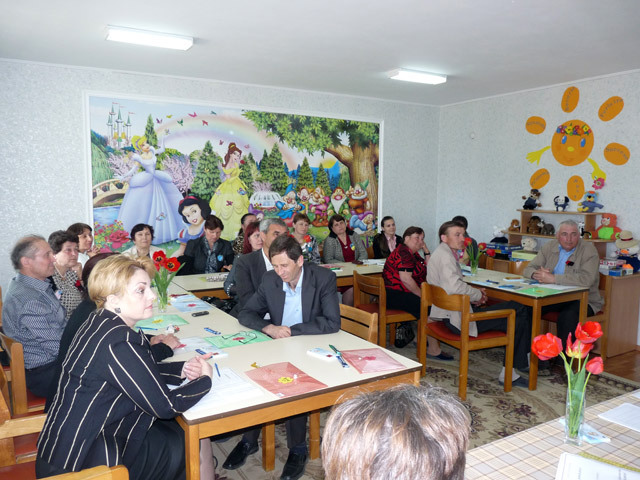 The traditional 11th seminar of the coordinators and educators of all day care centers BUNVOLENTIA took place on 27.04.2013. The day care center BUNVOLENTIA Cojusna played the role of the host this time. Each day care center was represented by an educator. The mayor of the commune Gangura, Mr. Ivan Basli, was also present. Guests of honor at the seminar were Mrs. and Mr. Martha and Peter Garst from the Swiss organization „Help for Children in Need “. Each educator could tell about the news, problems and desires of the children. We could again convince ourselves of how important such meetings are for the further work of the day care centers. The German organization “Aktion Hoffnung – Hilfe für die Mission GmbH” gives hope to 40 children from the commune Gangura, district Ialoveni, that they could visit the kindergarten within a short time. 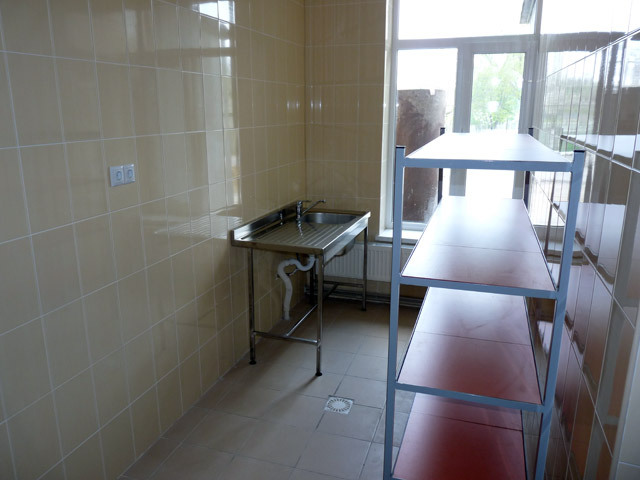 The organization financed furniture, bed linen and dishes, so that the kindergarten will be able to begin its activity. 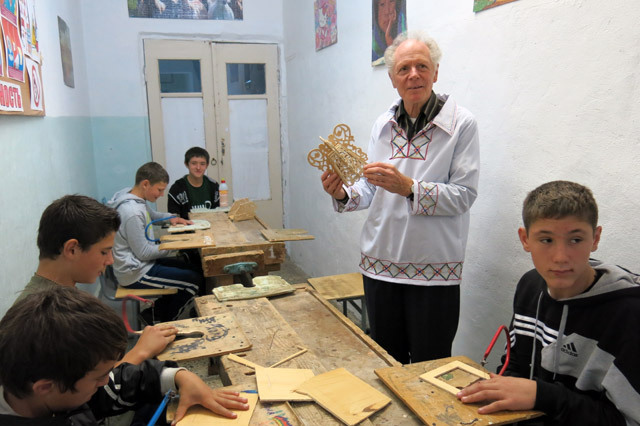 Mr. Manfred Ahlbrecht, the contact person of “Aktion Hoffnung – Hilfe für die Mission GmbH” visited our country and also the kindergarten in Gangura, in order to report on the accomplished project. 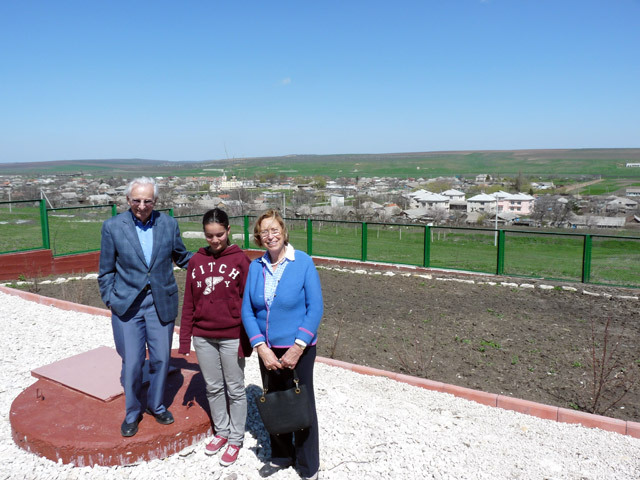 Mrs. Margrit and Mr. Heinz Haenggeli came together with their granddaughter Linda Haenggeli on visit to Moldova, in order to see their day care centers for children BUVOLENTIA – Cojusna and BUNVOLENTIA – Alexandrovca. Everywhere they were cordially received by the children. The little ones prepared beautiful greeting cards, to express their gratitude. The mayors of the communes Gangura and Cojusna, Mr. Ivan Basli and Mr. Victor Capatina, thanked kindly to Haenggeli family for their generous support. 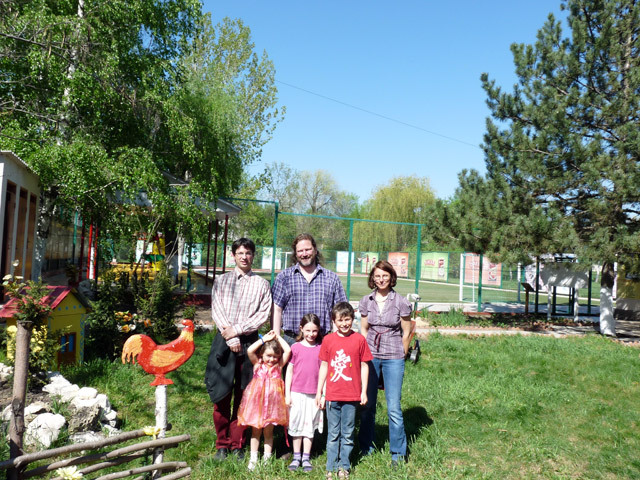 Mr. Douglas Funk from Solon Foundation / Switzerland traveled once again to Moldova, in order to visit his project, scholarships for students in need. 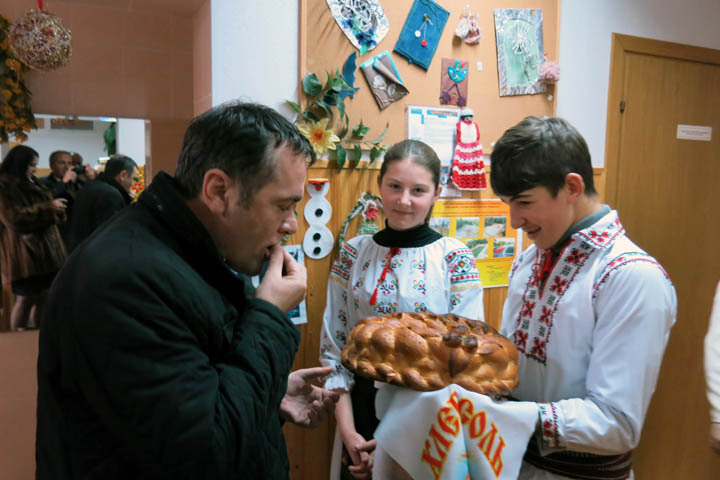 He met some families in the villages Puhoi, Misovca, Gangura, Alexandrovca, Cojusna, as well as in the city Chisinau, in order to make an impression about the family situation and get to know the families and the living conditions of the financed students. Mr. Funk was received everywhere with deep gratitude and appreciation. The parents thanked him for the great assistance, without which most students would not continue their studies. 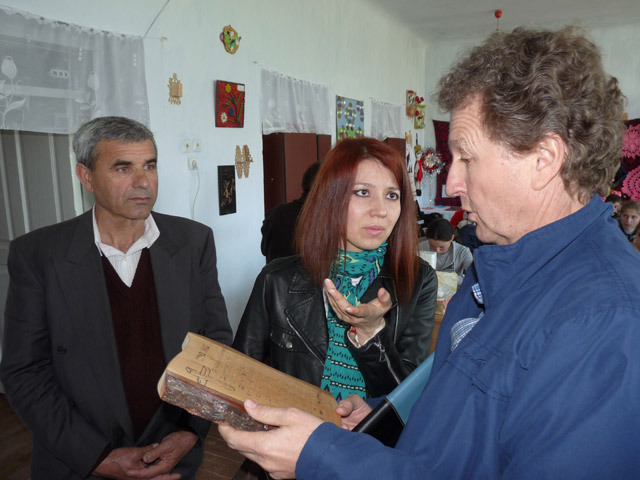 Mr. Funk also visited our day care centers for children BUNVOLENTIA in the commune Gangura and in Cojusna. The day care centers BUNVOLENTIA – Petrovca and BUNVOLENTIA – Vladimirovca are placed in school building. 50 children, who attend both day care centers, have old school furniture at their disposal. Children need a pleasant environment for a good training process that was provided by the German organization „KINDERMISSIONSWERK“. 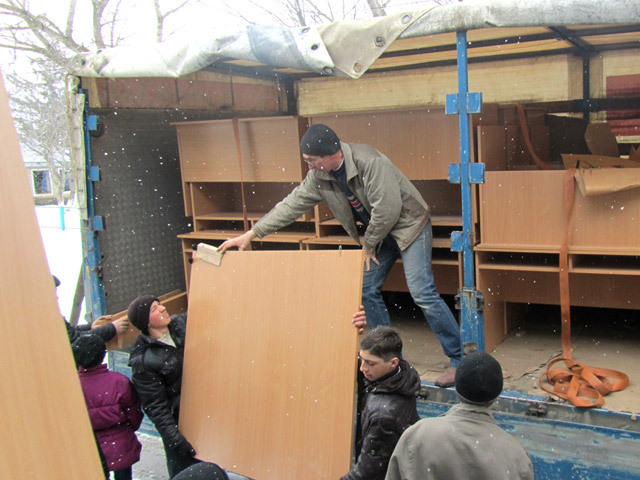 Financial resources for new furniture were collected for both day care centers due to the “Sternsinger” action. 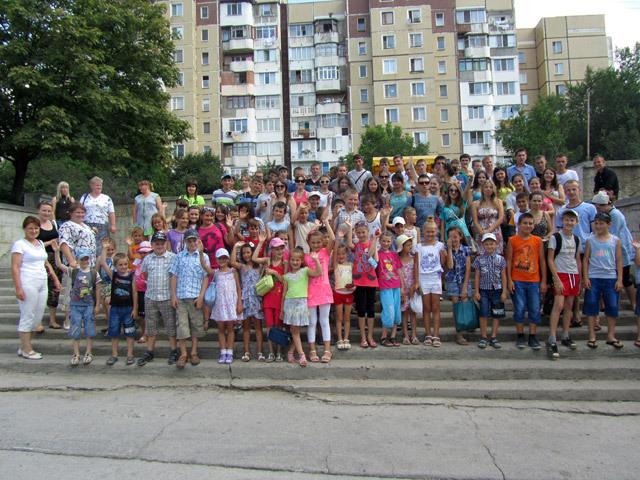 It is a beautiful action of the German children for Moldovan children. 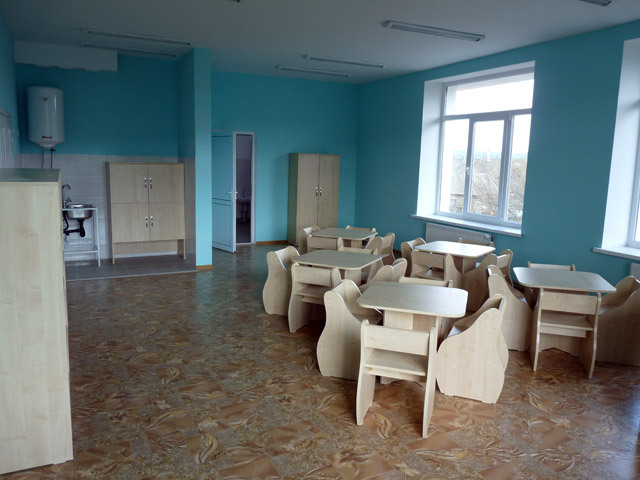 So the children from Vladimirovca and Petrovca are pleased with new tables, chairs and cupboards. Our spiritual leader, Priest Pjotr Kuschmann, was distinguished for his social commitment and for his charity; he was awarded with the title “Person of the year 2012”. We are pleased about it, congratulate him and are proud that he is also involved in our organization. 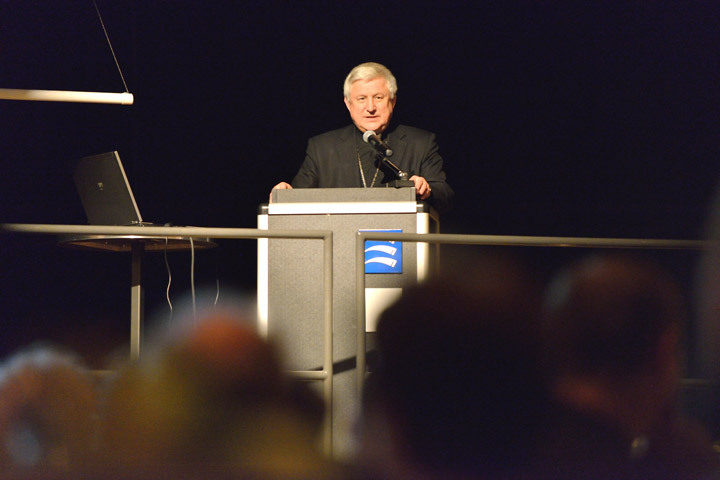 The traditional annual general meeting took place on 31 January, 2013. 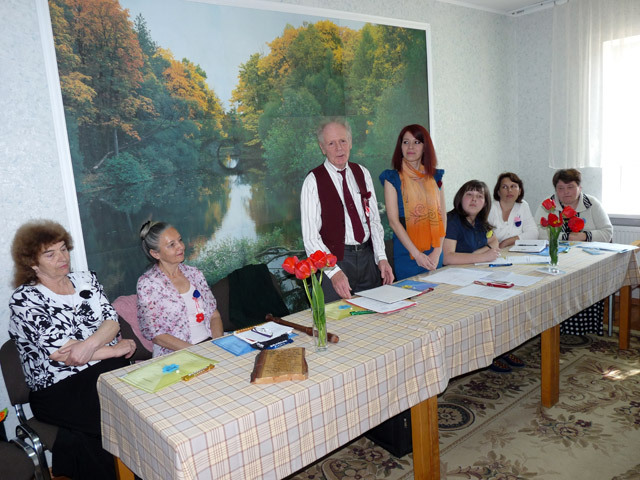 The founders and members of the charity association met within the general meeting of PRO UMANITAS (PU) to discuss about the current and future projects of PU. The president of PU presented the results of PU-activity during the year 2012. The work plan and the budget for the year 2013 were also approved. We inform our partners and friends that the video „Day Care Centers BUNVOLENTIA – A glimpse into a better future“ was added to our web page. This video shows the results of a year-long work with children from poor, socially vulnerable families. Please click to see the video below. 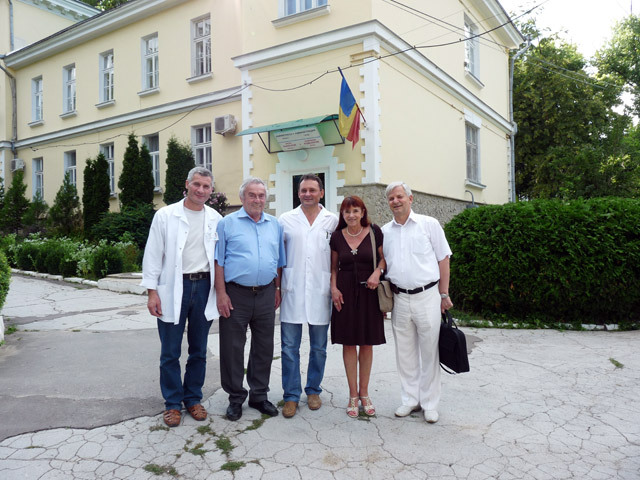 The President of the German organization “Hilfe für Osteuropa e.V.“, Mrs. Ursula Honeck was visiting Moldova together with Mr. Gunther Köllner. 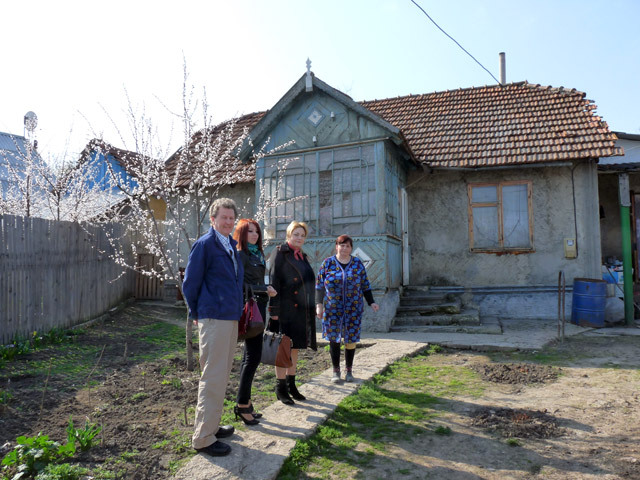 Our visitors traveled to their partners in Orhei and Edinet, in order to convince themselves of the correct distribution of humanitarian aid to different beneficiaries. 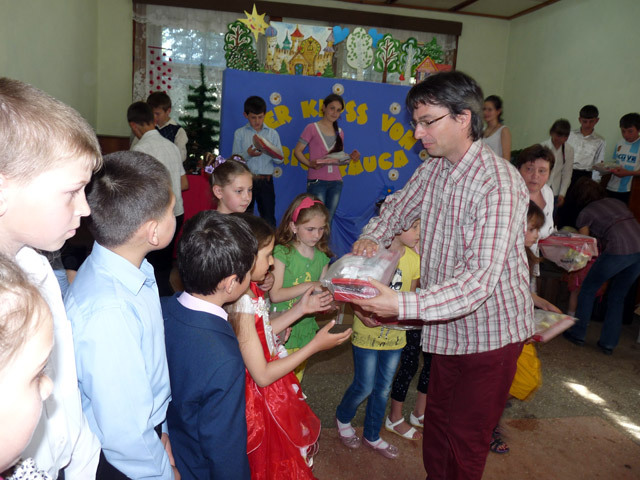 The children clinic “Emilian Cotaga” from Chisinau received valuable instruments from the organization. Besides, Mrs. Honeck and Mr. Köllner met the financed families and could hand them over the money. We would like to inform our partners and friends that the electronic version of the Activity report 2012 is available now.